Back in the mid-1990’s, I owned a 1990 Ford Mustang GT 5.0. Had a lot of fun with it. Even raced the GT at ESTA Dragstrip a few times. Alas, it became a little too expensive to keep running with two daughters becoming teens at the time. Soon after, Ford redesigned the Mustang and replaced the 5.0 with a smaller more technologically advanced 4.6 liter engine. In 2011, Ford reintroduced the 5.0 liter in both the GT and Boss 302 editions. Last weekend, I found one hanging out at the Sweet Inspirations Cruise In near Fulton, New York. 2013 Ford Mustang GT 5.0 taking part in a cruise in at Sweet Inspirations Drive-In near Fulton, New York. Nikon D700/24-85G, f/16, ISO 3200, EV 0, 24mm focal length, HDR Image. A Sweet Ride: 2013 Ford Mustang GT with a 5.0 liter V8 engine in Candy Red Metallic trim and a 6 speed manual transmission, 18-inch wheels and Borla exhaust with chrome tips. A Sweet Photo: Seven exposure, -3 to +3 EV, High Dynamic Range (HDR) image taken hand held which is why the ISO is 3200. After merging the photos in Photomatix Pro Plugin for Aperture 3.x, the resulting image had a lot of digital noise. I ran it through the Noise Ninja Plugin for Aperture to smooth out the roughness on the car. I elected to pop the colors a bit to go with the Mustang’s exterior color. 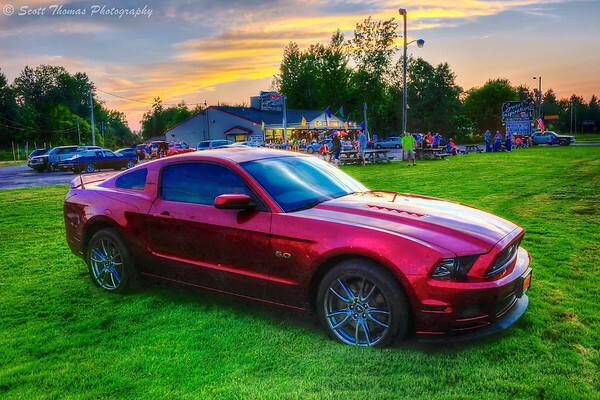 This entry was posted in Weekly View and tagged 24-85mm, 5.0, car, cruise in, drive-in, dusk, ford, fulton, gt, hdr, ice cream, mustang, new york, nikon D700, photomatix pro, restaurant, summer, sweet inspirations. Bookmark the permalink. You are not kidding, sweet photo and ride Scott, love the colors in this !! Thanks, Bernie! It sounded great when the owner drove her off.